Style, What Is It Good For? There are probably tens of thousands of rock art sites in Western North America and as many as a million individual panels. Researchers have used an Art History type of approach to divide the rock art into separate groups as a means to compare images from different areas. 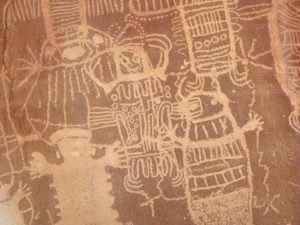 The stylistic analysis ideally provides insight as to the cultural group or the time period in which the rock art was created. It doesn’t always succeed in doing this and critics have questioned the validity of rock art stylistic classifications on several fronts. When faced with the alternative, style is still a helpful way to view rock art on a regional level. Come on over to the Eastern California Museum on Saturday Feb. 3, at 1 p.m. and watch noted, local rock art expert Courtney Smith provide “a rough shod attempt” to negotiate the slippery slopes of stylistic analysis. A rich variety of rock art imagery will be presented. 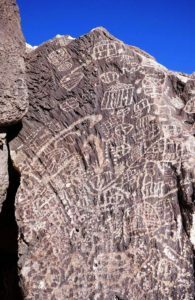 Smith has researched and explored rock art sites in the Eastern Sierra for many years and has one of the most extensive collections of photographs of these special archeological sites. 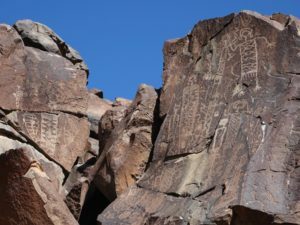 Independence resident Smith has been studying and documenting the West’s petroglyphs and pictographs for many years. His research on this ancient Native American art form has been published in numerous journals and other publications. 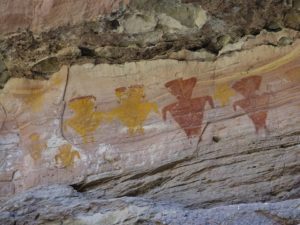 He has traveled across the region, from California to Oregon, and Utah and Wyoming and beyond to study, photograph and admire the beauty and regional variations and similarities of Native American rock art. The Eastern California Museum is located at 155 N. Grant Street, three blocks west of the Historic Inyo County Courthouse, in Independence. For more information, call 760-878-0258.